That voice in my brain made a good point. Pick a time in history and you’ll find people squabbling over who should be in charge. The majority of the major ‘plot points’ in World History revolve around one party challenging the power of their leaders. This dispute is usually resolved by the two groups putting bits of metal through each other (last one to die, wins). So randomly bumping into someone in Skyrim with a grudge against the monarchy is not so strange. Skyrim is not a game based in History (which is a shame), but each of The Elders Scrolls games has been heavily influenced by weapons and locations from the middle ages. Skyrim takes most of its inspiration from medieval Northern Europe. There’s a real ‘Viking-y’ feel to the whole thing. So far I’ve only played about ten hours of the game, but I’m already starting to spot the History behind the Fantasy. Once noticed, I found it quite hard to turn off History Teacher Mode, so I thought I’d go with it and inflict my observations on you instead. The horse and cart trundle into town, and the prisoners are unloaded. After a brief/lengthy [delete as appropriate] session with the character creator, you and the other criminals are lined up to be executed. The method of execution: beheading. We watch as the first prisoner is placed neck first onto the chopping block, and a downward axe swing separates the gentleman’s head from the rest of the gentlemen. This scene is, for the most part, an accurate depiction of a form execution employed in medieval Europe. Executions in public were also a regular feature of a feudal society. You deal with a serious criminal and remind the local populace what happens if they commit a high crime. However, decapitation was not a punishment given out to just anyone. It’s strange to think of a method of execution being more popular than another, but death by beheading was the preferred way to go. The quick, relatively painless removal of the head was seen as a much more dignified alternative than the other, much more common method of execution. Hanging was the capital punishment used on the common man; a much more common occurrence in the Middle Ages. Beheading was seen as a much more noble death. This perception continued for centuries – Anne Boleyn (Henry VIII’s second wife) requested a double-edged sword rather than an axe for her execution. It was all the rage in French high society, don’t-you-know. Wolves are everywhere in Skyrim. Walk in any direction for two minutes and you will soon find yourself pestered by black, scraggly mutts. And once again, we find a connection to the medieval world. 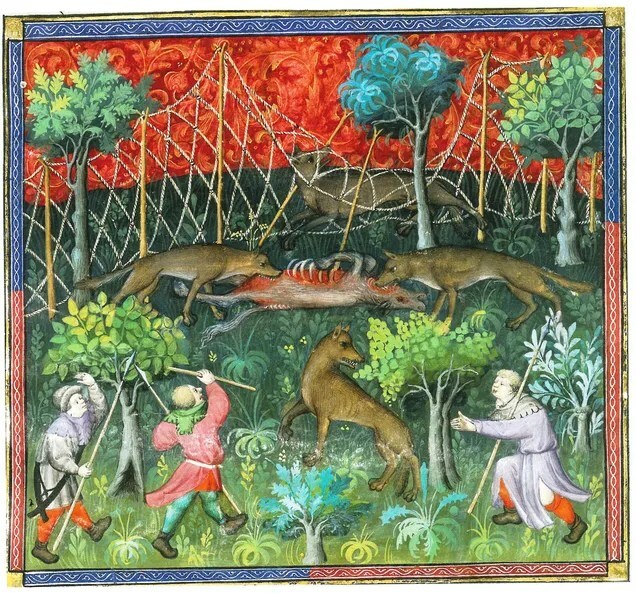 A thousand years ago, wolves were a serious problem for towns and villages in Northern Europe. In France, cattle were at so much risk of wolf attacks that the job of ‘wolf hunter’ became an actual profession, scoring high on the list of “Coolest Sounding Job Titles”. Ever heard the story of the Boy Who Cried Wolf? Well, there’s a touch of reality there. Young children in Anglo-Saxon England were given the job of watching over the village flock in case of wolf attack. So, if you ever hear anyone claiming that ‘kids today have it easy’… they are really,really right. Try this test: take a wooden spoon and a metal spoon from the kitchen. Holding one spoon in each hand, smack the implements off a hard surface. Notice the difference? The metal spoon transferred the force into your hand. This is an example I suggest to students when trying to explain why a metal shield is a silly and historically inaccurate idea. This is also why warriors wear padding under metal armour, why sword handles are bound in leather, and why shields are often made of wood. Plus the fact that the production of metal weapons and armour was far more expensive and time consuming. 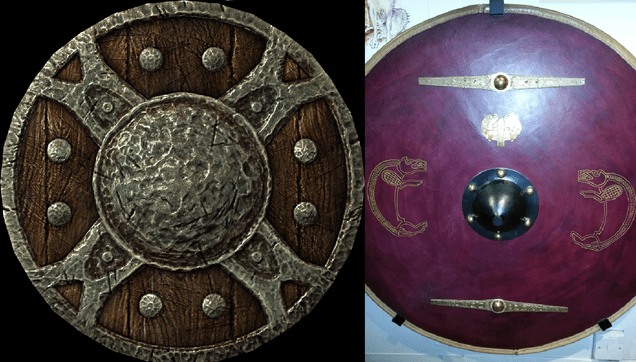 If you ever see a metal shield in real life, it’s probably ornamental. Most warriors of Northern Europe would use shields of wood. 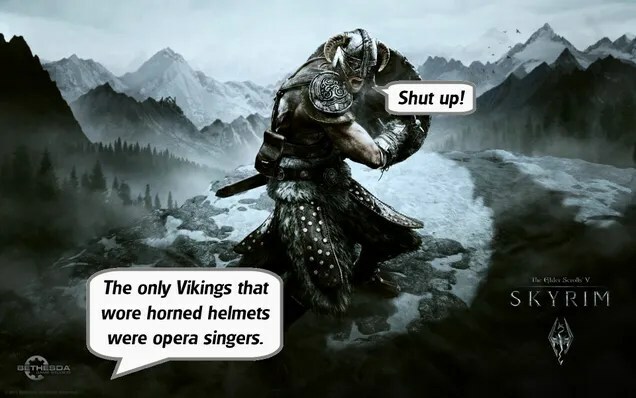 So pleased was I to see that some shields in Skyrim follow that logic. I’m sure that when I progress further into the game I will come across big, heavy metal shields with eccentric designs, but for now my warrior is wielding a shield like the one above. The other image is of a recreated Saxon shield. The only issue with the Skyrim version is that it has too much going on. Most round shields had a metal centre, behind which the hand holding it is kept safe, with metal bands either across the shield or around the edge. Few soldiers would put that much metal onto a single shield. The round shield is much more than something a Norseman would hide behind. That metal center (which is called a ‘boss’) or the metal trim around the shield edge could be used to bash an opponent, providing the opening for a free stab. I’ve already seen a ‘finishing move’ performed by my character where the edge of the shield was used to cave a rival’s head in. The way in which most shields in the game are held is also accurate. We often imagine shields as being something strapped onto the forearm, which did happen, but it was more common to see a shield held by a single handle on the back. This gave better reach and much more flexibility. Every house you go to in Skyrim, you can expect to find at least one book sat on a shelf. This is a pretty weird thing to see, considering most people in a medieval society had neither the time, nor the need, to learn to read and write. A farmer raised their children to become farmers. If a medieval boy wasn’t learning how to build or repair the home, they were learning how to fight. On top of this, paper was a difficult item to manufacture; owning paper was often regarded as a sign of high standing in society. Combat in Skyrim seems pretty straightforward. You click a button and the character swings a weapon. If you hold for longer, they swing harder. Not the most sophisticated swordplay you’ll ever see. Yet this is what makes close combat in Skyrim strangely accurate. Magic abilities aside. We’ve all seen movies and games with melee fighting in them. Swords clash, warriors spin and twirl, dodge rolls a-plenty, fights lasting for ten minutes. Medieval fighting is none of those things. A spin attack might look awesome, but if a medieval knight tried that they’d get a spear through the head for trying to show off. Most fights would last all of two sword moves. No skilled medieval knight would waste time blocking their opponent’s blade; they would have the skill to parry the blow and stab their enemy in the same move. And why would you clash swords? That would blunt the weapons. To me, the fighting in Skyrim is pretty close to the mark. Two opponents swinging for each other’s vital organs, clobbering each other into submission, letting the armour take the hit, focusing on attack. Maybe one too many swings from up high, but the real brutal essence of combat is there. This is a late edition to the list. I found one of these in my latest session with the game, and I’m really pleased to see it. When most people of a War Hammer is fantasy terms they picture a huge lump of metal fixed to the end of a wooden pole. 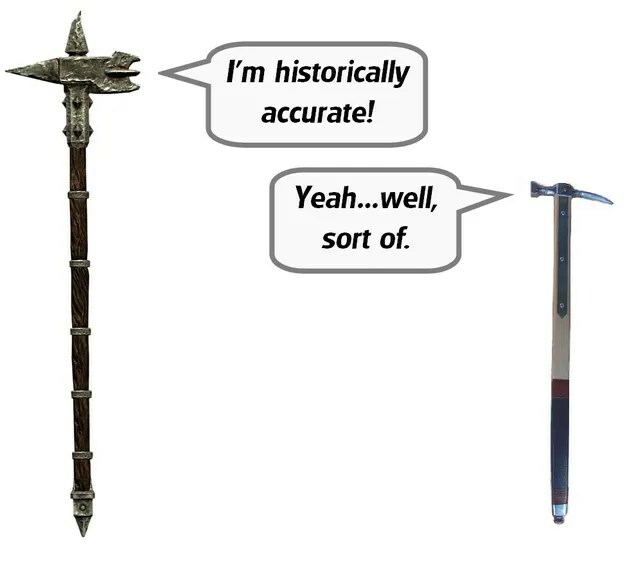 Again, those versions exist in Elder Scrolls too, but the Iron War Hammer is much closer to the genuine article. When you think about this physics of both the historic and the fantasy versions, I hope you’ll realise the former is way more brutal. The smaller, thinner hammer can be swung with the speed and accuracy of a sword, and the smaller surface area gives the weapon a real punch. These weapons were designed to break bones through the victims armour. …the Skyrim version is still way too big, but it’s an improvement. 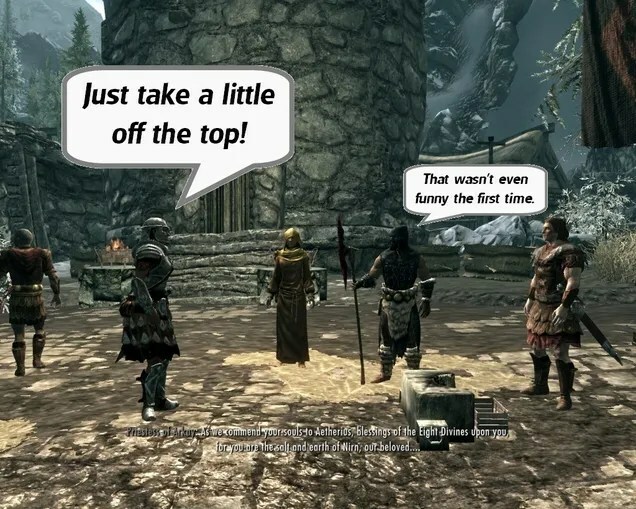 So after week one there’s a lot of little, really accurate references to History in Skyrim, not all of them are deliberate. When I’ve played previous instalments I made no attempt to spot the historic elements of the game, but doing it this time round has added an extra level of enjoyment to the experience. The only instance where I may have almost ‘spoilt’ the game occurred when I realised that the dragons aren’t historically accurate… which is a shame. Maybe you’ve spotted other historical (in)accuracies within Skyrim? Let me know. Or you may like to add to/correct the comments I’ve made here. I’m always eager to learn more.